The combination between the classic beauty and modern comfort with 09 and 12 en-suite fully equippeed and spacious cabins, bar, elegant dinning are, large sundecks and a professional team of crew, dedicated to every detail of personal services will make your trip with Seasun Boutique Cruise a truly unique and unforgettable experience. Based on the unique style, Seasun Boutique Cruise is designed perfectly by wood, stone and bronze in harmony between tradition and luxury. The rooms are both double bed and 02 single beds with full of well equipped, that bring you the memorable time in private atmostphere. In an at mosphere of elegant luxury, you can enjoy tasty menus served by a cre in traditional Vietnamese costumes fine dining hamoniously combined with the aromas of the sea. A wide selection of the best vintages from around the world will complement fine fushion cuisine and creative Asia – inpired flavors. Ha Long bay (Descending Dragon Bay), one of the great natural wonders of the world and a world heritage site, is famous for it’s majestic natural beauty that was recognized by UNESSCO in 1994. 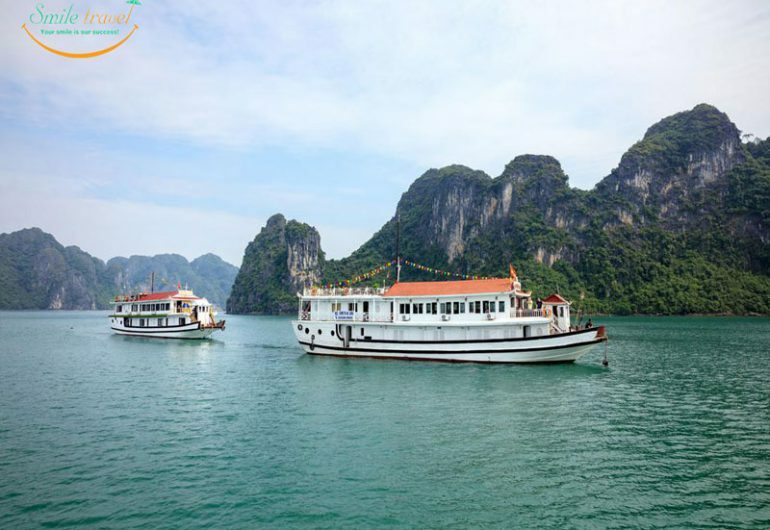 With thousands of fantastic island and islet, a lot of amazing caves, the crystal waters, Ha Long bay attact a large number of tourist every year. 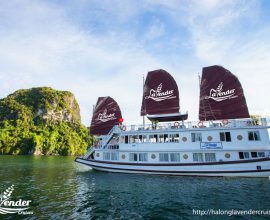 Outfitted in a traditional wooden style of elegant Asian inspired decor, Halong Seasun cruise spreads over 3 decks measuring 38 meter length, 8.5 meter width and 12 meter height. The combination between the classic beauty and modern comfort with 11 en-suite fully equipped and spacious cabins, bar, elegant dinning area, large sundecks and a professional team of crew, dedicated to every detail of personal services will make your trip with Halong Seasun cruise a truly unique and unforgettable experience. 08:00 Hotel or private address pick up with our shuttle bus. Short break half way. 15:00 Explore Sung Sot “amazing” cave with millions of surprising stalactites and stalagmites for 45 minutes. 16:00 Cruising to Titov Island. 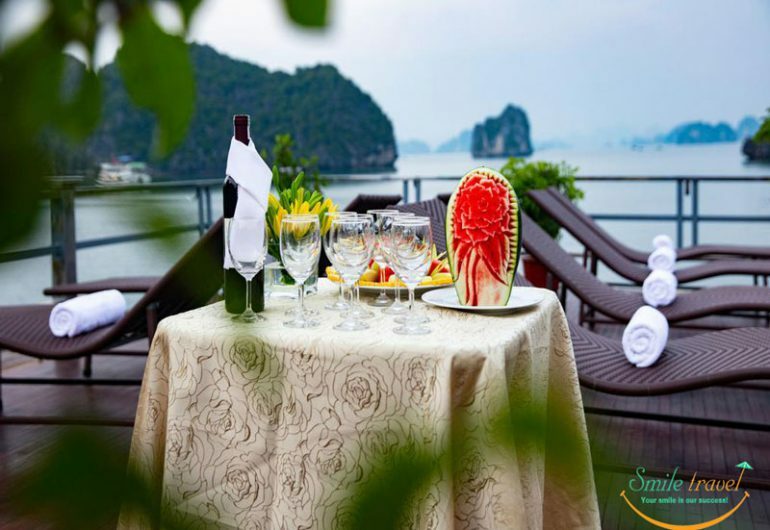 Go swimming and relax at the beach or climb up to the top of the mountain for a panorama view of Halong bay. 18:00 Enjoy the complimentary sunset party on the sundeck with wine and fresh fruits. 19:00 Dinner is served in the cruise’s restaurant. 21:00 Retire to your cabin, have a drink at the bar, sing karaoke, join the fishing excursion or play exciting games. 07:00 Breakfast will be served in the cruise’s restaurant. 08:00 Visit to PearlFarm. Enjoy kayaking to discover Halong beauty. 09:30 Check out your cabin and relax on the cruise while sailing on the bay. 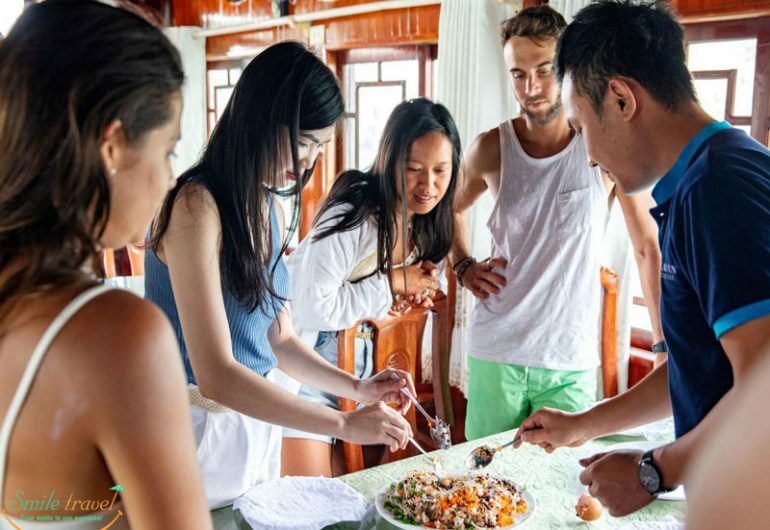 10:00 Join cooking class demonstration (teaching you how to make our speciality, Spring rolls) on the cruise. 10:45 Lunch is served on the cruise (or at a local restaurant). 11:45 Disembark at the harbor, Ha Long city. Take our shuttle bus to return Hanoi. 17:00 Arrive back your hotel or home. • Fully furnished deluxe en-suite cabin with A/C, hot water. • All services and items not mentioned specifically in the list above. • Free for under 4 year-old children, sharing with their parent. • Charge 75% for from 4 to 10 year-old children, sharing with their parent. 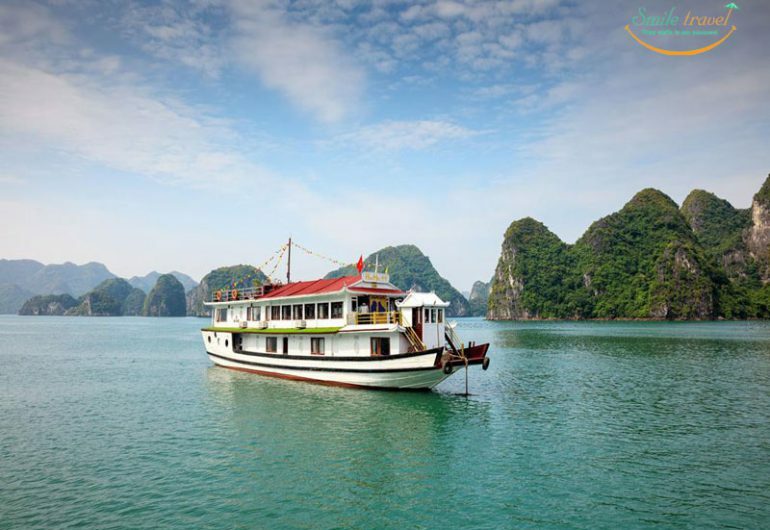 Ha Long Bay, one of the great natural wonders of the world and a world heritage site, is famous for it’s majestic natural beauty that was recognized by UNESSCO in 1994. With thousands of fantastic island and islet, a lot of amazing caves, the crystal waters, Ha Long bay attact a large number of tourist every year. 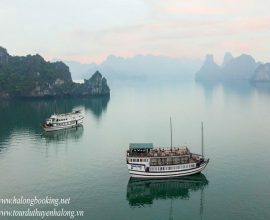 06:00 If you like enjoying Ha Long bay’s sunrise, please get up early before 06:00. 07:00 Breakfast will be served at the Seasun cruise’s restaurant. 08:30 Transfer to daily boat to explore Ha Long Bay. 08:00 Enjoy kayaking to discover Ha Long beauty. 11:45 Disembark at the harbor, Ha Long city. Take our shuttle bus to return to Hanoi. Please kindly provide us your passport information at least 01 week before the cruise date. The FOC rate for children under 5 years old is applicable for 1 (one) child sharing a cabin with 2 (two) adults. Only 1 (one) child under 5 years old traveling with two (2) adults is allowed for FOC per cabin. Children from 5-09 will pay extra charge 75% of adult rate. Children 10 and above must pay full fare as adult. Peak season surcharge: Surcharge $50/adult and $40/child for Gala dinner applies if guests stay on board on December 24th and/or December 31st and Tet Holiday. Before departure from Hanoi to Halong Bay (none of the services has been used): 100% refund. During the trip (some services have been used: transfer, lunch, day trip, hotel in Halong, etc. ): used services will be charged, the rest will be refunded. The trip be cut down from 2 nights to 1 night, tourists will be charged a 2 days/1 night trip, plus other used services, the rest will be refunded. The final cost will be confirmed by your consultant via email. In all cases, please contact us directly for any urgent help. We are here to support you with all of our best! We will always be available for you, 24 hours to support you. Halongbooking.net Managed by SMILE TRAVEL. 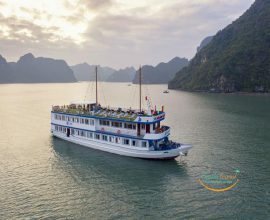 Here on our website, you can find listings of the best-selected cruises of Halong Bay, one of the UNESCO World's Natural Heritage. 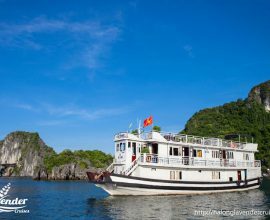 Let's select your perfect Halong cruises.